This page is how the Node "Was"
The SWNH user port is on 147.405 running 1200 baud, SWNHU is a Server Port on 441.025 also running at 1200 baud which primarily serves as a dedicated link to NHGATE, our internet gateway. SWNHU used to be a link to BRATVT which has long since left the air, plus an AMTOR BBS that has also gone away. KEENE is a "stepping" point so that stations using the SWNH node complex don't need to go across the matrices twice and their traffic can remain on the Backbone side of the house. 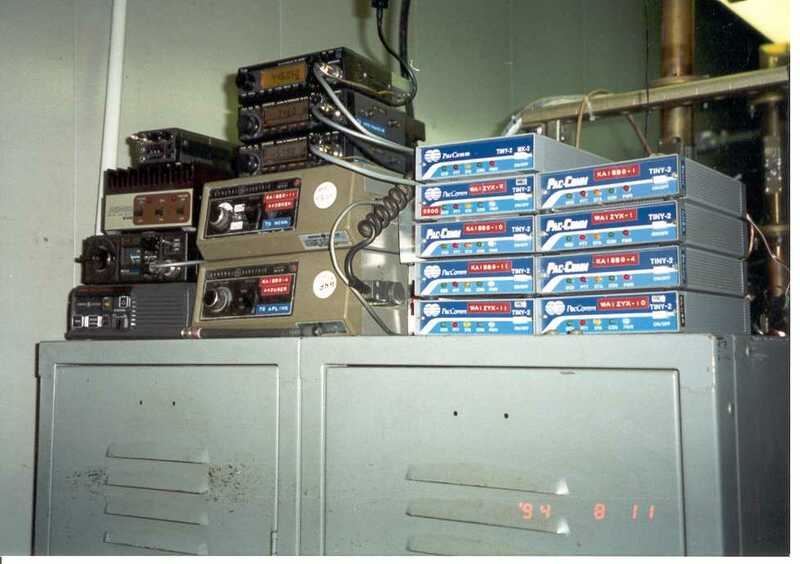 The Node is currently running 9 PacComm Tiny-II TNC's with dedicated point-to-point links running at various baud rates up to 9600. There are a couple TNC's that currently are "inactive" but still connected and turned on. The node is divided into two Stacks, with backbones on one side and user ports on the other. BBSZYX - The local bulletin board system has also gone off the air for a couple reasons. The major reason was lack of local use, more than likely due to the internet, and the old 386 was not Y2K compliant. As you can imagine, all the messages were pretty reliant on having a correct date, and 1980 really didn't make the messages happy! I decided to just take it out of service as opposed to replacing the computer because there wasn't much on it except a bunch of useless forsale and wanted messages anyway as of late. The nodes are part of the NEDA network. There are also links to other systems that NEDA doesn't particularly care for. Those being the YCCC DX-Cluster network access from NHDX to K1XX, and NHGATE from SWNHU which as mentioned above is an Internet to Packet radio gateway. This is primarily used for linking for the Dx-Cluster, for example, OH2BUA is almost continuously linked to the K1XX DX-Cluster to support his efforts. This is a neat HomePage and you ought to check it out!! It also supports a couple links to areas that aren't reliably served by any real radio networks. NHGATE does not support any WW chat servers, and is highly restricted. Basically it's a support system for the locals only. NHGATE or AMRAD as we call it is restricted to support a couple links and local users only. Also, PLEASE, DO NOT ASK for access, because this is a supplement to, not a replacement for, Packet Radio. If you are interested in the DX-Cluster, there are a zillion connected directly to the Internet, so I encourage you to go to one of those. Same holds true for a Packet BBS. Movie Clip of SWNH in action. Don't let the date fool you, these pictures were captured from a video tape made back in the mid-90's. Same for the movie clip.